The 8th shogun Tokugawa Yoshimune developed Mt.Asuka and made the park open the public Monk Yuei at Kinrinji Temple in Ohji Gongen Shrine erected the monument in 1737 to commemorate the opening. 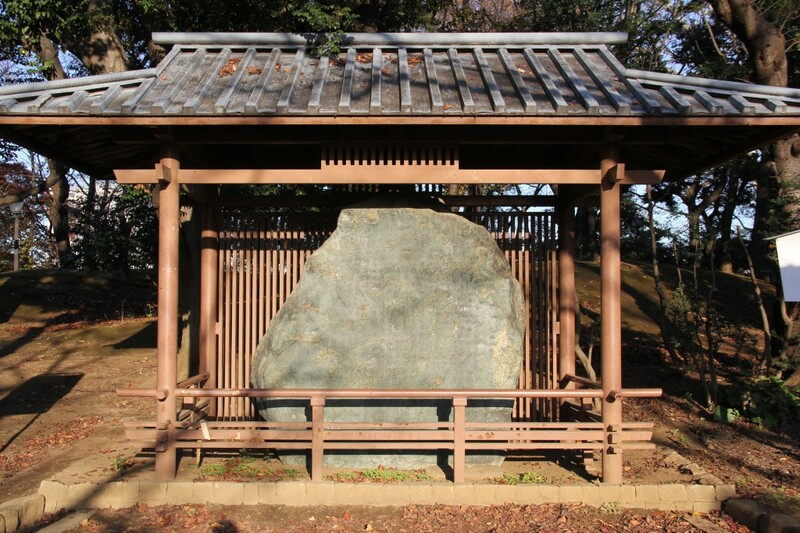 The stone had been stored in Takimitei in Edo Castle after being presented from Kishu region The inscription was composed by Narushima Douchiku (Kinkou), who was a confucian vassal of the shougunate. Tengaku (title of the inscription, engraving calligraphy) was made by Yamada Sojun, who was a calligrapher and a doctor in Owari region. The history of the monument erection is detailed detailed in “Asukayama no Hi no shimatsu (record of Asukayama no Hi)” written by Kazusada (Ryoushu), son of Douchiku. The writing style of the inscription is elegant in fashion of Shousho, one of the five classic texts of Confucianism. The inscription is considered to have trumpeted the peaceful society under the rule of Tokugawa Yoshinume. The monument is 218.5cm in total height, 215cm in width and 34.5cm in thickness. This inscription tells the history of Kanjo (ceremonial transfer of a divided tutelary deity to a new location) of Ohji Gongen (current Ohji Shrine) by the Toshima, the origins of the names of Ohji, Mt. Asuka, Otonashi River and that the people took care of Ohji Gongen With their cordinal belief. The end of the inscription tells that Tokugawa Yoshimune planted trees and flowers in Mt. Asuka, and had contributed to Ohji gongen Shrine. This inscription is difficult to read, because letters were written by using kanji variants and ancient writing, also slanted to avoid scars on the stone. But it is an important material to understand the history of Mt. Asuka. We visit here in our Tokyo North bike Tour.